The 2017 Dunlop MSA British Touring Car Championship returns to action this weekend (29/30 July), as the series speeds into Snetterton following its traditional mid-season break. Five events down, with five to go, and Britain’s premier motor sport showcase remains as unpredictable as ever. Nine different drivers have already won races over the first half of the campaign, with a total of 14 competitors having reached the rostrum, but now it’s time for the business end of the calendar with 15 races to go and everything still to play for. The BTCC is notoriously tight, competitive and fiercely-fought and this is borne out in the on-track action over the course of any given race weekend. When it comes to the quest for the coveted Drivers’ Championship crown, the cream always rises to the top. It may be little surprise, then, that reigning champion, Honda’s Gordon Shedden, currently sits atop the standings as he hunts down a third BTCC title in a row, a feat last achieved some 30 years ago by Andy Rouse and one that has never been repeated in the modern era of Britain’s most illustrious motor sport series. That said, he is now the man with the target on his back and he will have to hold off experienced battler Rob Collard – just 11 points shy of the summit – and double champion Colin Turkington only a further point back as the BMWs lead the chasing pack. Fourth-placed Ashley Sutton is next up in the championship chase, with the young Subaru star displaying some blistering form of late – securing a victory in each of the last two weekends and a trio of trips to the rostrum at Croft. His meteoric rise since joining the BTCC last season has been nothing short of spectacular, with some claiming 2017 could be his year, given that his current 20-point deficit could conceivably be overturned in just a single race. Early pace-setter Tom Ingram, triple champion Matt Neal and another title-winner in Andrew Jordan are all within reach of the top of the table with a whole gaggle of others looking to force their way into contention with a significant tally of points still to play for. Everyone in with even the slightest sniff of the championship lead will know that a single weekend can completely flip the outlook of the title tussle on its head. Competition will be as fierce as ever. A huge crowd always descends on the Norfolk venue, with the summer festival season in full swing and many more will be tuning in to watch all of the action live and in high definition as always, over on ITV4. A two-day test took place at Snetterton during the mid-season break, giving onlookers a rare glimpse of the form book. It was Adrian Flux Subaru Racing’s Ashley Sutton that secured the fastest lap time, as he edged out early pace-setter Jack Goff, with the latter performing extremely well across both days in the Eurotech Racing Honda Civic Type R.
Goff fell just 0.059s shy of the leading time, but he significantly completed nearly 140 laps of the 2.97-mile circuit across the two days – gaining valuable data as he looks to return to winning ways. “The title seems a long way away, but if you look at Gordon Shedden coming back from ninth in the championship to win it last year, then you never say never,” said Goff. Much of the running was completed in scorching summer conditions – with track temperatures reaching more than 36C – but the Dunlop BluResponse wet tyres also saw some action when rain arrived on the second afternoon, meaning teams should be well prepared for all eventualities this weekend. 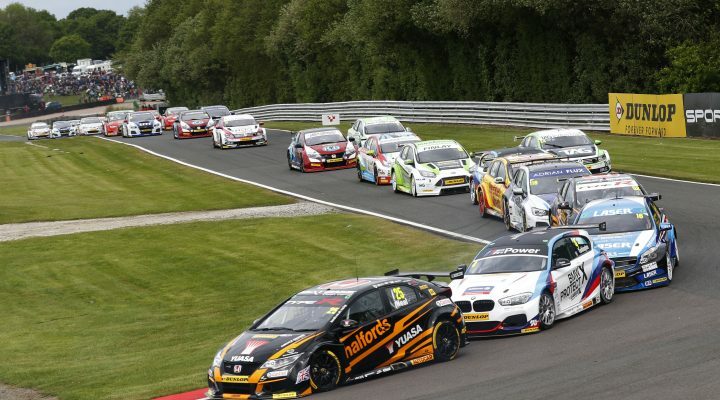 All three BTCC races on Sunday, 30 July – and the day’s other races – will be broadcast live and in high definition on ITV4. Those in attendance at the circuit can stay in touch with the commentary and live timing from every session, available at btcc.net/live throughout the weekend. The support series on the TOCA package are also guaranteed to thrill, with a double-digit total of races set to entertain the crowds. Porsche Carrera Cup GB, Renault UK Clio Cup, F4 British Championship and the Ginettas will all be appearing, making for a jam-packed weekend of truly unmissable racing. Tickets can be purchased on the gate at £15 on Saturday and £34 on Sunday, or £35 for the full weekend. Accompanied children aged 13 and under are admitted free. For further information and for advance purchases with discounts, see www.snetterton.co.uk or call 0843 453 9000.